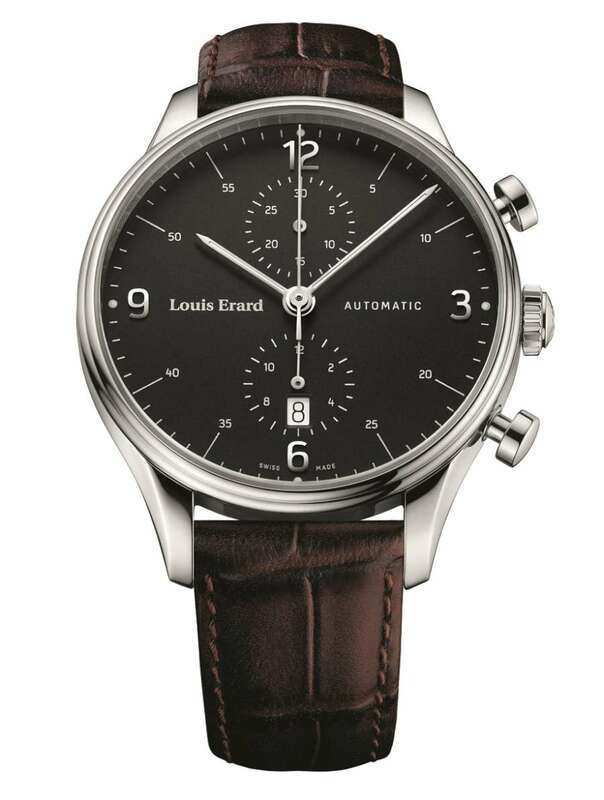 The new Heritage Classic Chronograph watches by Louis Erard are exactly what their name says: classic chronographs. This family of watches has a sober, discreet design, with two subdials for the chronograph minutes and hours, and the choice of no running seconds, or a cross-form subdial for running seconds at 9 o’clock. 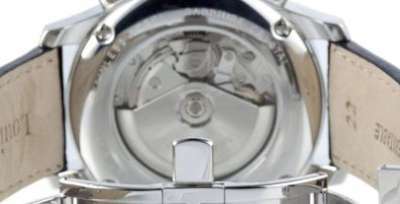 The dial is guilloché silver or black, with a seconds scale subdivided into single seconds without any further subdivision. The date is nicely incorporated into the hour counter at 6 o’clock. 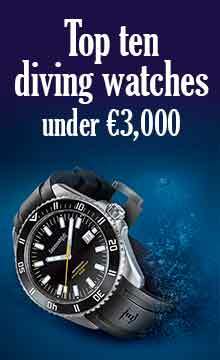 The results are attractive watches, with a 43 mm case diameter, a 5 atm water resistance (resistant to rain and splashes only), and leather croco-print straps or a Milanaise bracelet. They have display casebacks revealing the ETA 7750 movement. Louis Erard don’t provide any photos of the caseback but judging from this photo of another analogous chronograph by the same brand, movement finish is standard, with most of the view taken up by the oscillating weight. The mushroom-shaped pushers add a distinctive note, but the brand has preferred minimalism instead of adding extra automotive features. So there is no tachymeter scale, and a neat combination of four hour numerals and eight minute numerals – or no numerals at all as in the version below. The ETA 7750 has been the standard movement for lower-priced chronographs since its introduction in the early 1970s by Valjoux. Those years, just before the quartz revolution changed things forever, saw the introduction of the first automatic chronograph movements, the Heuer-Breitling-Hamilton Chronomatic, the Seiko 6139, and the Zenith El Primero, all presented in 1969. Valjoux was already a leading supplier of hand-wound chronographs with the 7730, and it presented the 7750 in 1973. The team responsible for the new movement was headed by Edmond Capt, who, born in 1946 in Le Brassus, was just 24 when he started work on the project. Its development time was shortened by another piece of new technology: the computer. Capt was given access to the Valjoux computer in Neuchâtel and was able to use it to simulate the movement’s functions. With its cam-operated chronograph mechanism, the 7750 has some distinctive characteristics, such as a mono-directional oscillating weight that winds the watch in one direction and spins freely in the other, something that you can discern when you are wearing it, and a chronograph seconds hand that often wobbles a bit when you start the chronograph. It is also a thick movement at 7.9 mm. But the influx of quartz watches led to the decision to stop production just two years later, in 1975, and to destroy the dies and drawings. Luckily, local management – probably Capt himself – simply hid everything away. At that time ETA was part of the ASUAG group, itself facing bankruptcy. It would later merge with another umbrella corporation SSIH in 1983 to form SMH, which in 1998 would become the Swatch Group. In 1985, interest in mechanical watches began to revive, and production of the 7750 recommenced. The movement is still being made today, with a few variations and improvements. It remains a very tough movement with an almost indestructible self-winding mechanism. The expiry of patents after 20 years and the Swatch Group’s decision to try to stop supplying competitors with movements has encouraged the production of 7750 clones by other companies. Sellita was a sub-contractor for ETA for years, making the 7750 movement, and so it was easy for them to start manufacturing their own version, the Sellita SW500. 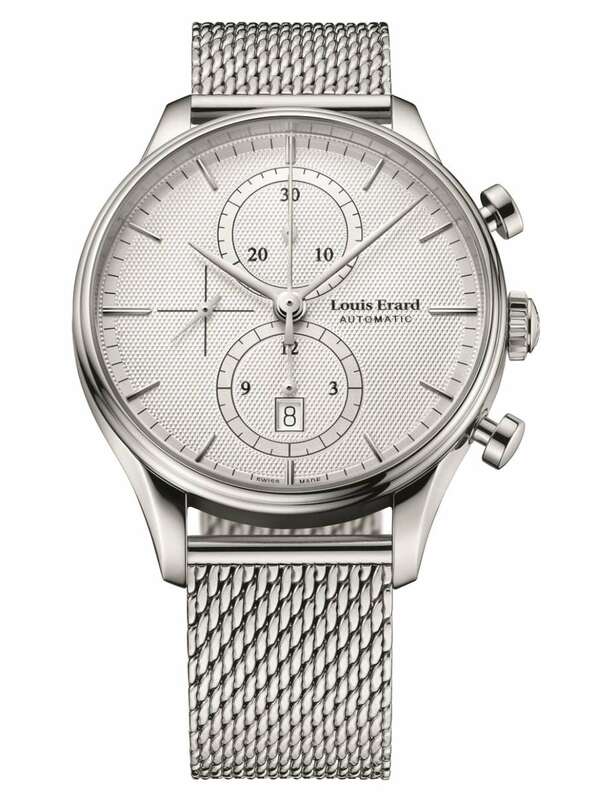 The outcome of all this is that after 45 years, the 7750 is still the standard movement for accessible chronographs, such as the Louis Erard Heritage Classic Chronograph. 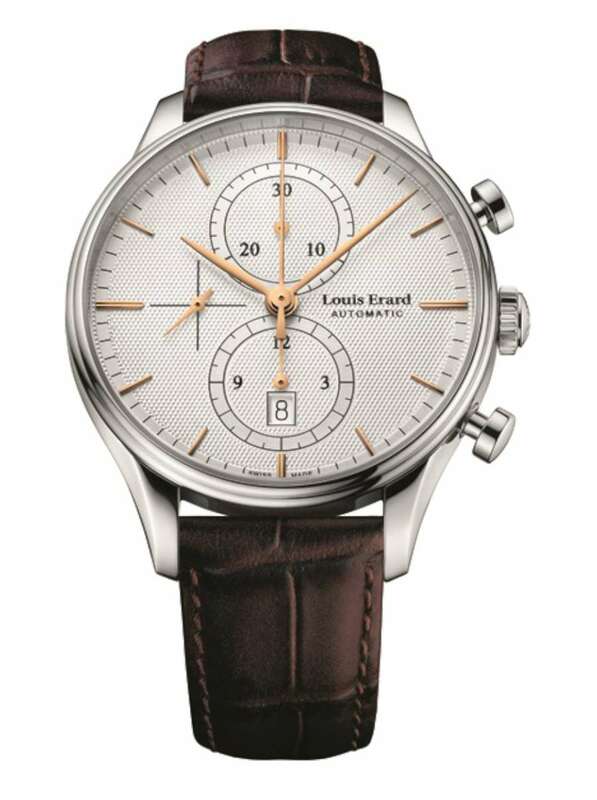 The Louis Erard Heritage Classic Chronograph costs €1,595 with leather strap, and €1.695 with stainless steel bracelet. Further information from the Louis Erard website.